I'd love to share with you about how to become a Young Living Essential Oils Member and get your oils at wholesale costs plus an extra gift that I have for you to get you started on the right foot! If you haven't read the five post series on how we experimented with different brands and methods of application, I encourage you to stop and take a look at those now. It outlines exactly why we feel that Young Living is the best, most effective, and most affordable essential oil option out there...full of facts, stats, and drop-by-drop cost analysis! First Post: Essential Oils: Do they really work or is it all just hype? BONUS FOR THIS MONTH ONLY!! in addition to our usual Wellness Resource Kit! If you still want a little extra information before jumping into the world of essential oils, read on for more details and options! 1. If you just want to try one or two oils so that you can check them out for yourself, you can set up a Retail Account and order exactly the oils that you are interested in. While going the retail route is not the least expensive way to do it, for those who just want to try 1 or 2 oils, this can be a great option! You go through the same link that you would to set up a Wholesale Membership, but just choose the Retail option instead. Pick exactly the oils you want to try, and have them shipped directly to you. When you love them and want to get a kit, you can email me for help flipping your account over! It's a good way to try the oils if you don't want to get a starter kit right off the bat. However, I would recommend that you NEVER pay full retail for these oils! Read on for why I think the second option is a better choice. 2. You can sign up for a Young Living Membership. I *highly* suggest this one. It's where I started, and it was an excellent intro into the world of essential oils. So what are the membership perks? With your membership, you get wholesale pricing for a year. It works just like a membership at Costco or Sam's Club. Your wholesale price is 24% off of the retail price. You are able to earn FREE oils if you buy a certain amount in a transaction. So far, I've had no trouble reaching that. This month, the free oils are Lemon, Purification, and Citrus Fresh! You get access to a private FaceBook group that will help you on your essential oil journey. You can ask questions in real time. It's been super helpful as I've learned how to use these! You get enough variety of essential oils plus a diffuser in your kit that allows you to fully experience what essential oils can do! 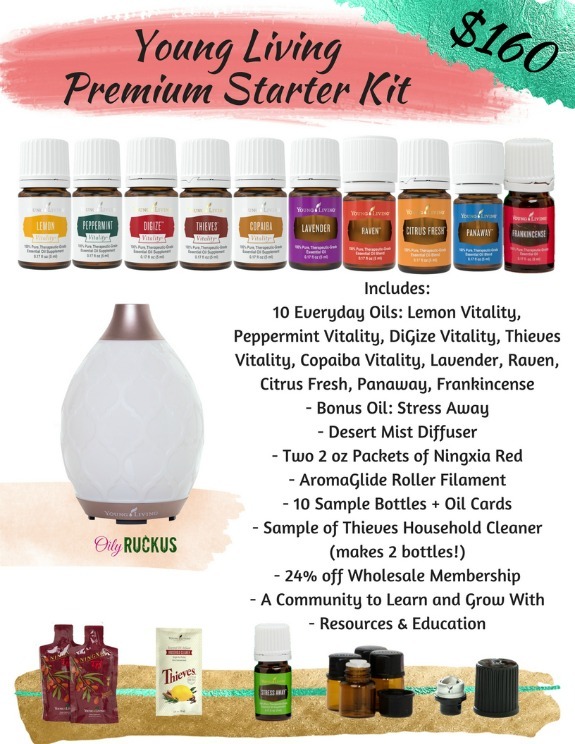 To sign up for a Young Living Membership, you simply need to purchase a Premium Starter Kit! The Premium Starter Kit is the one that I started with. If I had it to do over, I would hand's down choose this one again. It comes with the Young Living membership perks, the literature to help you learn about the oils, sharing bottles, a roller ball attachment for a bottle of oil, a bottle of Stress Away oil, the Everyday Oils Collection, a sample of Thieves Household Cleaner (enough to make two bottles worth!) and a diffuser of your choice. 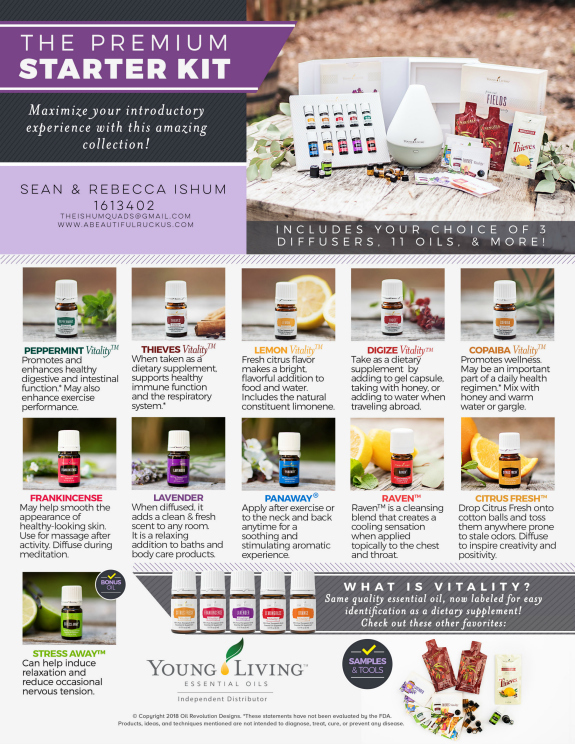 The Everyday Oils Collection has 10 different oils in it and you can find something for just about anything in that selection: Lavender, Frankincense, Citrus Fresh, Raven, Panaway, Lemon Vitality, Peppermint Vitality, DiGize Vitality, Copaiba Vitality, and Thieves Vitality. Your body's natural defenses will love all of the oils to work with! It is an awesome collection to support overall wellness as daily life happens, and it is an excellent way to get everything you need to give essential oils a good try! I promise you. This kit WILL pay for itself. Desert Mist Diffuser: The newest diffuser offered in the Premium Starter Kit is also my favorite option due to it's classy Moroccan design, quiet nature, and 11 light settings...including a flickering candle mode! It covers approximately 300 square feet and can run up to 10 hours. Even my little girls tried to convince me to let them have it in their room when they saw how pretty this one is. Dew Drop Diffuser: The Dew Drop Diffuser isn't just a diffuser. It's also an atomizer and a humidifier as well! It covers approximately 300 square feet and runs for up to 4 hours. It's a very quiet, simple to use diffuser with an on/off button that also switches off the ambient light if you prefer. Rainstone Diffuser: It covers approximately 300 square feet and runs for up to 8 hours. The Rainstone Diffuser has a very sleek, modern look that fits well in the home or office. It comes with a remote control that allows the user to pick a diffusing time of one, two, three, six, or eight hours which allows for maximum versatility. This is the one that we have in our living room! Aria Diffuser: It covers approximately 400 square feet and runs for up to 3 hours. The Aria Diffuser is a very high end, gorgeous diffuser that has lights, plays music, has a remote control, and other fun things like that! It even lets you hook your own personal music up to play through it's speakers. It's really pretty and definitely a conversation piece! But there is one really big thing missing from the Starter Kit that I personally think that you must have. You really need to have resources at your fingertips to use and explore as you need them! I so wish that someone would have thought to give me these when I started looking into the oils! A Reference Book. It includes the history of oils, a breakdown of each single oil and blend, and specific ideas on how to use oils to support overall wellness. This book is invaluable, and I reference mine often! An Essential Oils Quick Start Guide. This slim booklet gives you quick info in an easy-to-read format to help you get into your new kit right away! Look for the QR codes throughout this book for links to even more info + a body systems quiz to help you narrow where you should start focusing on your wellness first! A Roller Bottle, Dropper Bottle, and Capsules: You shouldn't have to hunt down basic accessories. I'm including a few of my top picks to make it easy to start using oils like a pro! ONLY AVAILABLE THIS MONTH: Get one of my personal favorite essential oils as an extra bonus: a 5ml Orange Vitality Essential Oil! Exclusive Oily Ruckus Group Access. Get exclusive access to our Oily Ruckus FaceBook group! This is a secret group (not searchable on FaceBook) that allows you to meet other oilers, get resources, and ask questions as you learn to use your oils. This group is only available to those who enroll in this downline so that they can get our personalized support and help! "Getting Started with Essential Oils" E-Series. Written to address many of the common questions that people have when they start using oils, our e-series makes sure that you have answers right away. Feedback on this four week course has been great! We want to make sure that you never feel like you have to figure everything out on your own! Me! Because you don't have to figure this out by yourself. How does the song go from Toy Story? "You've got a friend in me! "Cheesy, I know. But true! I love personally helping people learn how to be successful with their oils. 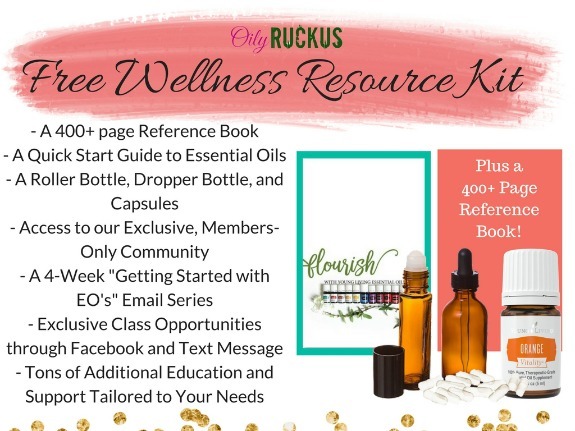 Please note that this Wellness Resource Kit offer is only valid with a Premium Starter Kit purchase through me. I'm using the referral commission that I get to buy this for you. Additionally, the Premium Starter Kit needs to be purchased in the same calendar month as when you sign up for an account. One last thing. I may be the only person who worried about this, but looking into essential oils does not mean that you have to stop wearing deodorant, quit shaving your legs, or raise goats in your front yard. You laugh, but I was really worried about not being "natural enough." I'm early in my journey, but I do still enjoy sweet tea made with refined white sugar, Taco Bell, non-prickly legs, and my Degree deodorant. And I'm pretty sure that (thankfully) raising goats in my front yard is against our city's ordinances. Update because of confusion: When you click the link below, make sure "Wholesale Member" is selected! Do NOT switch to Retail Customer, or you will be paying a LOT more! If you accidentally sign up as a Retail Customer, send me an email so that I can help you switch your account.. The information contained in these posts are for educational and entertainment purposes only. They are not meant to diagnose, treat, cure, or prevent any disease or ailment. Please do your own research and make your own informed decisions when you are considering lifestyle and health changes. Particularly if you are pregnant, taking medication, or have a medical condition, consult a doctor before starting any new protocol. Any links leaving this site are the opinion of the author of those sites and should be treated with the same caution as what you read here. This post may contain affiliate links. For more info, please see my disclaimer page. Are you still offering this? Also....are you available to answer down lines questions? Oh, yes! I'll remove the Welcome Kit offer when I'm no longer offering it. But for right now, it's still available! Just enroll and then send me an email with your address so that I can drop one in the mail to you! Can you clarify for me that I'm only locked into spending $50 a year to remain active with Young Living? I am very tempted to sign up under you but when I was reading the member agreement it mentioned needing to spend $50 a month in order to remain active and that you got to have one grace month...Is that new since you've signed up? If you could clarify that for me I would greatly appreciate it! Thanks! Yes! It is still *only* $50 a YEAR to stay active and keep your wholesale discount with Young Living. If you don't buy that amount, then your account goes inactive with no penalties. You were actually reading the member agreement for the Essential Rewards autoship program. That is totally different and completely OPTIONAL. I actually ask people not to sign up for that until they get their premium starter kit, use the oils, and fall in love with them. Then I give them the details on the ER autoship program down the road if they want them. If you are filling out the info to get your premium starter kit, fill out Steps 1 and 2. Skip Step 3 and the grey box right below it. Scroll down a little further and put in your payment info. Then keep clicking next until you get to the confirmation screen. When I use the link here will that sign me up under you? I have been reading alot on essential oils for a month now, I believe your blogs have been the best for me. I am excited to start! Yes, it will! Then after you sign up, make sure you send me an email so that I can send you a free Welcome Kit as well! Hi Rebecca, I just signed up to be a member and bought the premium starter kit under your code. I also sent you an email! Hope this deal is still available! Is there a listing of exactly what oils come in the premium kit? And do you still get samples as well? Rebecca!! I just realized- after reading your comments- That I signed up for the ER autoship program!! Is there a way to undo that until I finish my starter kit? I'd hate to loose that down the road, if I decided to spend that much a month!!! Glad you are hanging with us, and I hope you are enjoying your Welcome Kit from me! Absolutely!! You can just call the company and cancel it. You can enroll at anytime and cancel at anytime. No worries! Cancel it now, and we can always revisit it down the road! I am interested in buying this. Since the kit comes with one diffuser, do you have a suggestion or recommendation for additional diffusers? I would use one in my daugher's room, one in my son's room and one for my room so I need two additional ones. Also, are these safe for children under 2? Great post! I totally think you hit the nail on the head with this one! It’s getting a little nuts out there! I just signed up through your link, I'm so excited to get started. Thank you again for all of your fabulous information! Love having you as part of our team, Jenn!! Can you share your thoughts on usign Atomizing diffuser; when how why kinda approach answer? compared to standard Ultra sound based diffuser. ?